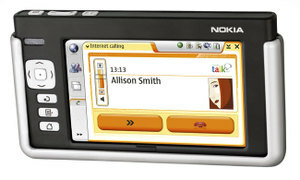 Nokia 770 Internet Tablet:ista on tullut uusi versio. TÃ¤ssÃ¤ videota ja tÃ¤ssÃ¤ lehdistÃ¶tiedote. PÃ¤hkinÃ¤kuoressa uutta on mm 770:an mukana tuleva GoogleTalk joka on ns internet-puheluohjelma (kilpailijat mm Yahoo ja MSN Messenger). We are pleased to offer this software upgrade to both the existing user base of the Nokia 770 Internet Tablet as well to new users. Since the launch of the Nokia 770 Internet Tablet, we have received a lot of positive feedback along with requests for both small and large improvements. It is a credit to the internal team, here at Nokia, that many of these wishes are addressed in today's' upgrade<(blockquote> Ari Virtanen, vice president of Convergence Products, Multimedia, Nokia.